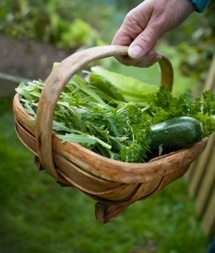 Grow an Organic Vegetable Garden to produce veggies that are inexpensive, tasty and bursting with nutrients. Here's how to grow organic vegetables even in small spaces. Home grown vegetables are healthiest when grown in an organic veggie patch. Following are tips and techniques for getting started. How to address all the needs of the plant gently and naturally using natural methods. It really isn't necessary to apply poisonous substances to your food crop to grow healthy vegetables. Organic means can be used to control every aspect of your growing environment. Whether your garden is a container garden, backyard plot or a raised vegetable bed you can employ our techniques for gardening organically. In any organic garden, start with good, well drained soil. Keep it light, fluffy and loaded with natural nutrients by amending your existing soil with compost or well rotted manure from herbivores (not meat eaters), along with moisture holding components like peat moss. Start your vegetable garden by marking off where you want the garden to be. Most produce requires six hours of full sun to grow. Lettuce, greens, and spinach are the exception. They are cool weather vegetables that will bolt in hot sun. Partial shade in late spring and summer is ideal for them. Use raised bed gardening techniques to keep the garden soil from becoming compacted. There are several ways to feed plants in an organic vegetable garden. Organic fertilizers such as fish emulsion work very well. Bone meal, blood meal, and New Jersey Greensand are other choices. Compost is the best thing for your vegetables. Sometimes referred to as black gold, compost will feed your plants and nourish your soil. You can make your own compost with a simple compost pile. This can be just a raised pile that you turn from time to time or it can be a purchased container that takes up very little room. This is a good choice for people who use small space gardening techniques. Vermiculture or the raising of worms is another way to feed your organic vegetable garden. Worm composters produce castings or worm excrement out of food scraps and junk mail. The castings are used as a valuable soil amendment. Another way to use worms is to have them in a container that has a spigot on the bottom. Moisture from the worms, soil, and excrement filters down to a collection area at the bottom of the vermiculture container. Open the spigot to allow the "worm tea" to flow out. Spray your plants with this once per season for a nutritional boost. Controlling pests in the garden is important. There are many organic ways to keep unwanted visitors out of your vegetable garden. Organic vegetable gardening uses a method called integrated pest management. This is a combination of methods used to control pests. It integrates organic pesticides with other controls such as predatory insects, companion planting, and hand removal of undesirable insects. Organic pesticides exist. One of the best known is Safers Insecticidal Soap. You can make your own organic pest controls. A couple of drops of dish soap combined with a teaspoon of alcohol mixed with water in a spray bottle will drive away almost all unwanted bugs when sprayed directly on them. Another way to control destructive bugs in the vegetable garden is to purchase predatory insects such as ladybugs, preying mantis, and predatory wasps. These predators will gladly prey upon the smorgasbord of unwanted bugs in your garden. Make sure that you offer the predatory insects plenty of shelter and water so they stay around. Finally, try blasting off any unwanted bugs with a strong spray from a garden hose. Handpicking pests or shaking them into a bucket of soapy water is another inexpensive organic control. There are diseases that will plague your organic vegetable garden. However many of these issues can be controlled organically. One of the best all around cures for garden diseases is baking soda. Mix a tablespoon of baking soda to a quart of water in a spray bottle. Add a drop or two of dish soap. Spray plants with this when signs of blight or fungal diseases appear. The baking soda changes the pH of the plants leaves. This prevents the fungus from growing and spreading. Good garden hygiene is important in controlling diseases. Clean up all trimmings. Dip your cutting tools into bleach in between cuts. Do not compost diseased plants or cuttings from diseased plants. Dispose of them in the garbage instead. Organic vegetable gardening is more than a way to garden, it is a lifestyle. Keeping pesticides and petroleum based chemicals out of the garden and out of your body is a healthy, earth friendly choice. Visitors to our Organic Vegetable Garden page may also be interested in the following pages.